Cloud gaming service OnLive says it wants to show its gratitude towards the people who supported it in its first few months. If you embraced the glorious future that is cloud gaming - that is to say, bought two or more games via OnLive - you might be eligible for some free swag. 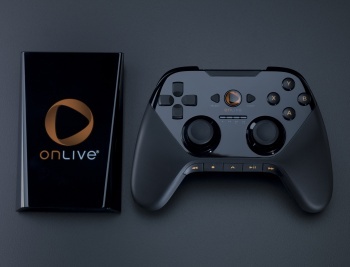 OnLive is rewarding early adopters with a free MicroConsole, which will allow the lucky recipients to stream games on their TVs, without having to get the computer involved at all. In a post on the OnLive blog, founder and CEO Steve Perlman said that it took a special kind of person to try something new and untested like cloud gaming, but thanks to those intrepid trailblazers, OnLive had been able to test and refine its service, to make it better for everyone. To show its gratitude, Perlman said, OnLive was offering "founding members" first dibs on the MicroConsoles, which ship on December 2nd. In order to qualify for the free stuff, you have to have bought two or more full PlayPasses on the service before the deadline of November 23, 2010. If that applies to you, then all you need to do is pre-order your MicroConsole before November 30th, and cough up for postage. Perlman added that if someone qualified as a founding member, and had already pre-ordered a MicroConsole, a discount would be applied to their account automatically, reducing the cost to zero. OnLive also has a present for people who have only bought one PlayPass since the service launched, which is another PlayPass, up to a value of fifty bucks - more than enough to buy any game on the service. This seems like a pretty smart bit of marketing for OnLive. Positive word of mouth crucial for the service at this early stage in its life, so keeping the early adopters happy with freebies makes a lot of sense. There's still plenty of work to do to convince people to give cloud gaming a try, but this is definitely a move in the right direction for OnLive.